So, he really was going through with it huh? Zexama thought in her head as the so called Yocho was looking a bit too confident than he was meant to. She could observe the loud cheering and eventually the quick movements that Yocho made to get close to her as well as punching himself in the check. This hit caused a bunch of corn to come flying towards her direction in numerous areas however Zexama could see each one. She raised a single hand causing corn sized balls of candy appear next to and absorb each bit of corn. As Yocho then tried to punch her straight in the chest, she spun her hand around and spiralled her fingers at the same to make all of the bits of candy balls grow before moving in front of the fist that was about to hit her chest. She then channel some Ki into her feet causing streams of rock candy to travel underground before attempting to latch onto the feet of Yocho and spin around his legs. They won’t apply too much pressure at the moment by they did manage to try and cover every part of his body except the arm that was punching up to the neck. She tried to grab the arm that he was using to punch her very precious skin. If holding, she would hold it firmly and stretch it in and out continuously before letting it go. She then taunted. ”Alright Mr.Yocho, now that you have stretched I think you are ready to fight!” The candy around Yocho then would have fallen to the ground before withering away into air. Zexama then thought that it would be smarter if she reduced her Pl to a more fair level. As she pulled it down, she set her Pl to a good level of 20,000 and left it there. She gave her own arm a stretch before giving a big smirk before her skin began shaking around and her form changed into the look of the familiar friend, Rische. Then in a familiar voice she said. ”Hey Yocho! Sorry I missed you last night! I was gonna train with you but I couldn’t make it, wait… how do I know about that?” As the smile ever so faded away she cracked up laughing before switching off all emotion almost instantly and springing off the ground with her back foot. Yocho looked down at his legs. Huh. Well, that backfired quickly. Yocho was sure he could have at least humiliated Zexama. As soon as he thought that, the candy started latching onto all parts of his body. It covered every part of his body up to his neck apart from his arm. Needless to say, Yocho wasn't a big fan of the candy touching some parts of his body. When the candy finally let go of him, Yocho relaxed his guard slightly. This would have been the perfect opportunity for Zexama to attack him. But she didn't. She was too busy trying to humiliate him. Just like he did the other day. Except his words were more like swords than pies. Zexama cared more about the show than the fight! Yocho could use this. Or, at least, that's what Yocho thought before he heard his friend's voice. Then he forgot all strategy, all his carefulness. In fact, Yocho barely noticed when Zexama kneed him so hard that it knocked him to the other side of the arena. Although because of that, it didn't really hurt him at least. Yocho jumped over to Zexama. This time, Yocho went for her face, hitting Zexama with a barrage of punches, and with each punch Yocho said another word. "What! Have! You! Done! With! Rische! You! Monster?!" A person of unadulterated rage. And he wouldn't stop until he either killed Zexama or saved Rische. The barrage continued until finally, he used his tried-and-true method of having the last punch be his very hardest. It was good that Zexama didn’t take as much care to the pathetic taunts that Yocho offered much anymore, him calling her a monster really would have been a mistake any other day. However today she was enjoying herself, she knew that she would get through to this simple minded idiots sooner or later. ”Silly silly Yocho, I was Rische all along! So in fact, when you called me an idiot earlier, I was the one laughing all along…” Zexama then saw the fist that came to her and was actually not expecting as much pain as was experienced, but it seemed to do not that much since she was still standing firmly on her feet. As Yocho continued the furious punches of his, she kept taking them in the chest before a slight bit of pain arose. She looked over to the judge and shouted over to him. ”Hey, I think there’s a bug on me! Could you please get some bug repellent of somethin’?” Zexama laughed a bit before she decided to be really mean and she span around, attempting to grab the hand of Yocho while she boosted her power level back to her normal form and started to scream very, very loudly. Her Ki enraged up very large and the padded tiles on the ground started to crack and fly away. ”YOU ARE INFERIOUR!! !” Zexama then would raise her arms and try to make giant sword come out of the ground, four in total, as well as a chair appearing right behind her where she sat comfortably. In a few moments, Yocho forgot everything else, and knew only the fight. He didn't know why, he just knew he did. He barely heard anything she said as he realised candy swords were rising. And then he decided to take a risk. Zexama was playing him. He knew she was. Every mistake he made, she would call him out on it. The audience would laugh at him. So now it was his turn. To play Zexama. To play the audience. I mean, how badly could candy swords hurt? As it turned out, pretty bad. But Yocho. Had. To. Stay. STRONG! The swords were swiping at him furiously, but Yocho held his ground. He was going to show Zexama how strong he really was. And though it was killing him inside, Yocho stayed standing through all the attacks. More than that, he smiled. What better way to mess with Zexama than to let her think he was enjoying her attacks? Yocho really hoped she didn't go harder because of this. Luckily, she finally stopped her furious attack. The pain Yocho was feeling caused him to stumble back, though he tried (if not a very good attempt) to make it seem as if he was preparing an attack. During these few moments of peace, Yocho took the opportunity to notice everything around him. Zexama was sitting on a candy chair. And even though it was just candy, it was... Actually pretty intimidating. It made it seem as if she was some sort of queen, and Yocho was about to be executed. But he wasn't dead yet. And that was the important thing. Nobody would die today. But during these moments of peace, Yocho didn't just observe, he remembered. Words that he wasn't paying much heed to because, well, because he had better things to do. Things like beating Zexama and proving himself. "Silly silly Yocho, I was Rische all along! So in fact, when you called me an idiot earlier, I was the one laughing all along..."
NO! Yocho knew Zexama was playing him. He wasn't about to let her get under his skin. Besides, Rische was on a field trip. He saw it on Zexama's computer. Zexama's computer. Which she had access to. Which she could edit. Which she opened to Rische's file. NO! Yocho came to Zexama's office because he was looking for Rishce, not the other way round. But Rische was the one who told him about the field trip. Could it be that Zexama knew he would come without Rische and manipulated this whole event? Why? Why?! Tears were coming out of Yocho's eyes now, but it didn't matter. His head was down. His hood was up. Nobody could see him, but his body. Yocho wasn't in control of his body anymore. And maybe it was better that way. Yocho could feel himself inching ever closer to the Turtle Hermit's throne. He didn't know what she was doing now. He didn't care. He just wanted revenge. Or could it be worse? Could it be that Zexama was Yocho's best friend? Yocho had lost many things, but Zexama had taken away what was most important to him - His only friend. NO! His mind was urging Yocho, no, begging him to think this through properly. But his body had control now. And while his mind wanted to stay calm, his body wanted justice. Yocho looked up slowly at Zexama, and finally, he took off his hood. Yocho allowed the turtle hermit to see the tears in his eyes, the rage in his eyes. For a second, he was about to stop. To call it a day. To forgive, and to forget. But the time for peace was over. "What. Have. You done. With. My friend." This was the second time Yocho was saying this, but this time he didn't want an answer. He wanted to destroy the turtle hermit. He whispered the words, so only she could hear, because he knew no words were more terrifying than those that were whispered. Yocho hoped he sounded terrifying, because he was even scaring himself. Because nothing is more scary than someone who has nothing left to lose. So Yocho didn't wait for the turtle hermit's answer. He grabbed her by the throat and showed her what he was waiting to show her since he first met her. His true power. Yocho grabbed Zexama by the throat and started floating up into the air. When he was high enough, and Zexama didn't have the breath to do anything else, he would drop her, and he would kill her. The time for Mr Nice Guy was over. The Yocho of olde was dead. Now anger reigned supreme. No control. No discipline. Just the pure rage that had been inside of Yocho his entire life. Zexama wasn’t feeling like this battle was going entirely as planned, however it was obvious that Yocho was a stupid as a new born baby who had its head replaced with a watermelon before being dropped off the lookout. Zexama stared at Yocho with a blank, expressionless look. She watched as he burst into tears, expectedly as well as say in quite a creepy tone what she had done with his friend. ”You silly billy, have you EVER seen Riche and I in the same place? He is my student after all. Oh yes, and the fact that you had gotten expelled was known to me? Well we can think ‘Riche’ for that can’ we. Since Zexama had lowered her power down a lot she didn’t really see how quickly the attack from Yocho had come. When she was grabbed her swords puffed into golden sparkles of candiness. Yocho had grabbed Zexama by her neck, then while he successfully lifted her into the air quite high. She saw that he was trying to suffocate her so what she did was quite simple, she stopped breathing… Zexama didn’t really need oxygen, she had the ability to breathe using her magical candy. As Zexama was lifted further into the air, she saw the blind rage that Yocho was emitting. This is a perfect time for a lesson! Zexama thought to herself. As soon as Yocho dropped her she activated own flight ability and giggled at a bit as she spoke. ”Did you really think I didn’t know how to fly? Riche could fly… remember?” Zexama broke into a loud laugh as she knew she was just making Yocho even madder so that she would be able to show just how much sheer could interfere with your fighting. Following up the steady floating that she was currently doing, she shot a burst of Ki down at her feet send her above Yocho and then eventually behind him. She turned around gracefully and attempted grab both of his arms at lighting like speeds. If she had successfully grabbed Yocho’s arms she was grasp them even firmer before trying to pull both his arms behind him while returning to the hard, cracked tiles that made the arena, while trying to force Yocho with her. ”Rage is a weakness, you are weak.” Blandly she spoke as if her intent was to insult him, however it was only a short amount of time before Yocho fought Zexama with his actual strength, not some teddy bear punches. Yocho saw that Zexama knew how to fly, but he didn't care. The rage didn't care. About everything she had been through. Sure, she had a tough life. Maybe even as bad as his, but she did something unforgivable. She stole his friend. Because rage was powerful. Rage was strength. Rage was everything and rage would make sure Yocho destroyed the person who had ruined his life. Whereas usually Yocho thought about himself, these next moments were brand new to him. He didn't care about himself. He didn't care about Rische. Heck, if Zexama was lying, if Rische flew up to him right now, he wouldn't care. Any part of Yocho that had love in its heart was gone. All Yocho cared about was destruction. Yocho looked down and saw how easy it would be to snap the neck of every single person in the audience. Would that make him feel better? He doubted it, so he didn't go down. Zexama was the one who ruined his life. And Zexama was the only one he would destroy. And then, maybe, just maybe, the pain would stop. Yocho looked up at where Zexama was. Everything felt slower to Yocho. Everything was easier, but Zexama wasn't there anymore. Wallowing in his own self-pity. Stupid, stupid Yocho. Now was not the time for that. The rage was in control. Let the rage be in control. It was easier that way. Easier to hate Zexama than to love Rische. Yocho punched behind him, assuming Zexama would have tried to sneak up on him, before he felt thin air and realised that Zexama might have simply flew higher, so of course, Yocho punched back behind him, but it was too late. Zexama grabbed his hand while he was still turned round and started pulling it behind him. Because of the raw strength of Zexama, he couldn't escape, and he guessed Zexama would probably try to grab his other hand to destroy control of his body completely. For a few seconds, Yocho was conscious of everything. The rage was gone due to the physical pain he was feeling now. Physical pain was easy, it was the emotional pain that destroyed him. But he wouldn't show weakness, he wouldn't let Zexama win. Embrace the rage! Embrace the hate! The voice inside his head. The voice Yocho hadn't heard in years. His pure, unadulterated rage. Sure, he let it out sometimes, but never like this. He never realised it was his rage until it was too late... And those were dark times. He had no one. He needed no one. And then he went to the New Turtle School, and everything was fine, and sure he got angry, but it was never like it was before. He didn't want to kill. He didn't want to destroy, to leave nothing left! But Yocho didn't see Zexama's eyes. He only saw Rische's. And he realised that the only person who had cared about him was a lie. Yocho was better off... Not as himself, but as the worst version of himself. If there was no one left to hurt him anymore. Once upon a time, Yocho would have tried to fight without using his full strength, to stop him hurting people like Yocho himself hurt every day. Forget the light. Embrace the darkness. His so-called "other side" didn't say anything. Because Yocho knew that no matter how much he pretended otherwise, the rage was a part of him. And it was Yocho, not anyone else, who wanted everyone dead. Yocho looked back. He assumed the turtle hermit was in shock. He didn't care. If it wasn't her dead beside him, he didn't care. Yocho could feel the rage inside his body. Even as a kid, he had never gone this far. He had always been afraid. He was a fool. But no more. The rage was practically circulating around his body, and he felt the power that he had kept hidden for so long. Even against the weakest opponents, Yocho would find creative ways to fight them, never using the full extent of his power. Not today. Not now. Yocho did what Zexama tried to do and tried to grab her arms himself. If his grip held, then he would use her as a stool and ride her as fast as he could to the bottom of the arena. If he didn't, well, Zexama probably had a plan herself, and Yocho was going to make sure she didn't get the chance to use it. The world was a beautiful place when you had no feelings. So much simpler to just kill than worry about dumb stuff like being a good person, or helping people. Oh well. It was time to stop thinking about how amazing this was and start thinking about how to commit cold-blooded murder. Zexama’s mind scrolled though thoughts that were going flashing in her head at the current time. She could see in poor Yocho’s eyes that something was going on in his mind, she could see true evil dance with the small amount of hope and good that left in him. She could sense his Ki, the Ki that was struggling to become balanced, Yocho was confused, he was unstable, very unstable. He wanted one thing, that one thing Zexama couldn’t give to him. ”You ignorant fool.” Said Zexama quietly as she saw Yocho getting ready for an attack that was most likely intended to kill her. ”You cannot defeat, you will never be able to.” Zexama felt the feet of Yocho push into her back as she disabled her Ki and began flying down towards the ground. As the speed of both of them grew and grew, Zexama’s panic did not, she casually let herself be taken to the ground before the last second, where the tiles should have shattered underneath the sheer power of Yocho push Zexama. Zexama’s Ki stabilised her in the one spot, Yocho’s weight made close to no difference as Zexama gently released her Ki and landed softly on the tile below. Zexama raised her head and looked at Yocho with quite an annoyance. ”I’ve been reading up on your act in the turtle school, why you were expelled, who the REAL hermit of that time was.” Zexama displayed a holographic picture of the Turtle school Hermit at the time but was still in a defensive position knowing Yocho would listen. ”Yocho, you will never be able to defeat, not because of your lack of strength, but by the fact that you have never killed someone on purpose, furthermore, you haven’t killed someone who didn’t deserve.” Said Zexama coldly, then, raising her voice. ”LOOK AT ME! THINK BACK, WAS YOUR TURTLE HERMIT A WALKING AND TALKING PINK BUBBLE GUM MAJIN? EH? ARE YOU SO STUPID THAT YOUR STUPIDY HAS EVEN CLOUDED YOUR MEMORIES! ?” Zexama now knew for a fact that Yocho would result in violence, she raised her arms and kept a straight face, she had no idea how Yocho would react, but she would soon find out. Yocho was still angry. So. So. Angry. The turtle hermit was speaking reason, but he still didn't understand. Why? Why?! Where was Rische?! Why was his life so terrible?! Yocho aimed a massive punch at the Turtle Hermit. She had her hands up in defence, but it didn't have the same effect as it normally did. The punch was incredibly powerful, like none he had ever done before. It would hurt Zexama badly this time, and he wouldn't even need to taunt her like he did before! Time went in slow-motion as Yocho closed his eyes, hoping against all hope that he would finally defeat Zexama. This would be it. The make-or-break moment. Would Yocho kill the Turtle Hermit, or live the rest of his life in agony. As Yocho allowed his hand to control its own movement, Yocho readied himself for what would come next. Yocho opened his eyes. His fist was barely an inch away from Zexama's face, but it hadn't hit. Why? Yocho would have felt it if she had done something to him, so it wasn't that... So WHAT?! Yocho was still in thought. Yocho jumped back. Hopefully it would surprise Zexama. Sure, he didn't want to kill her anymore, but that didn't mean he didn't want to beat her. As Yocho started pondering his next strategy, time seemed to pause again. 'I am you, after all. Yocho knew what to do now. He thought about everything bad that had ever happened to him, every terrible thing that he had done, and he summoned it to him. It wouldn't be as powerful as if he had stayed angry, stayed in his rage-induced state, but then again, why would he want it to be more powerful? He could kill Zexama, or he could show her his strength. Even if he wasn't out for revenge anymore (OK, that was a lie, he was still kind of fixated on revenge), he could embarrass Zexama in front of all her students. Anger and rage at the loss of his friend. This gave him power. This gave him hope. The anger was bubbling to the surface, anger which had stayed relatively hidden for as long as Yocho could remember. It was time. Time for the moment of truth. Yocho looked inside himself, looked for the power to summon the strongest ki blast that had ever existed and he would watch as his rage left him. Yocho felt as if a part of him was leaving him forever. It was. Maybe Yocho would never be as strong as he could have been, but at least he wouldn't have to deal with wanting to kill people all the time. So with a nod of the head, Yocho shot the ki blast. The ki energy was chaotic due to the pure rage that Yocho put into it. Not just a blast. A pure, chaotic beam of ki was headed towards Zexama. Yocho could feel the power of the beam. And it was draining him. He watched as the beam wrapped around Zexama like a jungle vine, covering her almost completely. Yocho managed a smile as he thought about it. 'The Monkey Beam'. That was a good name (that is, if he'd ever even be able to use it again. Yocho could feel the power draining from his body). Yocho clenched his hands into a fist and the monkey beam followed suit, squeezing into Zexama. Yocho wasn't sure how powerful the beam was. Zexama was so much stronger than him. But he could feel his energy draining. And he was sure it must have had some effect on Zexama. Yocho kept his fist clenched as long as he could, but he knew that as soon as he let go, the beam would stop. This would be his toughest battle yet, and he would be the one to stay standing, not Zexama. But Yocho couln't keep his fist clenched for too long and finally, he slowly opened it up, and the beam quickly dissipated. Yocho felt empty inside. Whether it was the toll the beam took on him or the loss of his rage, he didn't know. But one thing was for sure, well, two things, but who was counting? 1. Yocho's uber-rage was gone, and he'd likely never reach the same levels he could have with his rage. 2. He was going to stay standing. Hopefully the beam would have had a large toll on Zexama too, and he hoped Zexama would collapse before he did. But the beam really did take its toll, and Yocho doubted he could stay standing much longer. But he. Had. To beat. Zexama. He was standing on pure will power. His energy was gone. His adrenaline was gone. All that was left was will power. And if Zexama had emerged unscathed from his attack, it was all but guaranteed that Yocho had lost. And as he looked through the smoke with eyes that could barely stay open, all he could do was wait, and see whether Zexama was fine or not. Zexama looked at the power of Yocho’s almighty attack, her scouter showed the sheer power of Yocho and his Ki blast. Zexama looked over at Yocho with a soft smile, she could sense that his inner being had become, not in a fight with itself but in agreement. She laughed softly as the massive attack came towards her at great speeds. 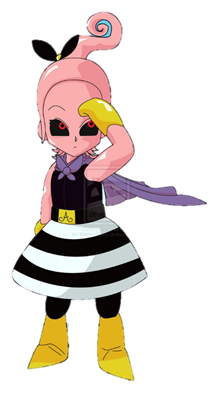 She raised her hand to block the attack and raised her power level to her normal height and Yocho’s attack merely was absorbed in her pink hand. She felt a bit bad for doing so but she ran over to Yocho and caught him before he fell to the ground. She softly whispered to Yocho. ”You have grown much stronger even in this short amount of time, feel free to train with me at any time you want, Yocho.” Zexama looked around as the crowd cheered and shouted before people started talking and leaving the stadium. Yocho collapsed. He didn't even get the chance to see whether Zexama had gotten past the attack or not. Before his mind switched off, he heard Zexama compliment him. He smiled a little, but Yocho could feel the effects of his attack. When Yocho woke up, he saw an incredible amount of food waiting for him. Yocho didn't think he'd ever seen this amount of food in his life, so he wolfed it down as fast as he could. The monkey beam's effects seemed to finally be wearing off, so he tried getting up. Guess they weren't wearing off after all. Actually, something else was weird. Really weird. Like... He didn't know... Or did he forget? Yocho had to find Zexama. He didn't like this. He couldn't think straight. His memories were starting to scramble. And if that happened... Life always screwed Yocho over. If he forgot that he had forgiven Zexama, then if he started training with Zexama... Bad things could happen. Yocho had to find Zexama. Before he forgot her. Yocho tried getting up again. His body wanted him to fall again, but his mind needed him to find Zexama before it was too late. He stayed standing until he reached the door where he grabbed hold of the door frame. He walked across the corridor, still grabbing hold of the wall to support him. Yocho could just about remember where he found Zexama's office, and headed towards it. Maybe Zexama could help him avoid losing memories, maybe his memories would come back in time, but there was no option. Yocho had to find her and Yocho couldn't hate Zexama again. Yocho hesitated as he reached Zexama's door. He was worried that she was still mad at him, or that she wouldn't agree to help him, but he... He had to try. Yocho lifted his hand off the wall and knocked on the door, deciding to be polite since he normally wasn't. Before he tried to put his hand on the wall, he collapsed again, and rather than try to stand up again, he sat against the wall and hoped Zexama was in her office. Zexama was currently meditating in the quiet room as she had to hone down her Ki to what seemed like singular level. At the same time she slowly created a small piece of candy with red stripes wrapped around it. It slowly unwraped and before the candy float above Zexama but in front of her as well by about half a meter. Her antenna fell to the ground before pushing Zexama off the ground, with an open mouth she ate the entirety of the candy with chewing at all. She thought a good seven hours would be enough and Yocho was probably awake by now. Zexama walked back to her office casually before seeing what seemed to be Yocho knocking on her door. As she walked up behind him she yelled. ”COME IN!” Zexama then continued to walk past Yocho and threw her massive doors. She smiled as she jumped over her desk landing on her seat with her antenna and pushing herself up, doing a flip, then landing on her bottom. She slowly span left and right waiting for Yocho to walk into the room which apparently was harder than winning the Olympics. For some motivation she yelled out. ”Well Hurry Yocho! Ain’t got all day!” Zexama turned on her computer to see a list of things that were annoying and would go away. Zexama would then interrupt Yocho. ”Yeah Yeah, but wait, how do you get rid of these viruses man!” She started whispering a few curse words to the faulty computer before they somehow went away and a smile popped onto Zexama’s face as she held the Computer’s hard drive in her hand. She had ripped the hard drive straight out of the computer, which actually made the viruses go away fortunately! ”Go on Yocho.” She turned off the monitor which had nothing on it and swung around to Yocho paying quite a lot of attention, especially in Zexama’s sake. But something else was happening too... The more he was forgetting, realised he was forgetting? Things were missing from his memories, but at the same time, the more he thought about his lost memories, the stronger he felt. He still wasn't as strong as he normally was, but he might be able to fight. Yocho pointed at Zexama, and said weakly. "I think I need your help. The attack... It's done loads of harm to me, I'm starting to forget stuff, and, I think -"
Yocho looked down and smiled morosely. "I don't know what's gonna happen next, so, I think..."
Yocho looked up at Zexama and smiled. For real, this time. "If I'm gonna die today, I'd like to have the best day of my life. And that means the best fight of my life. I'm not as strong as I usually am, but..."
Yocho tapped his fists together. "I'd like to leave enjoying myself rather than hating someone else. Please... I know I'll lose, but I want my final moments to be against you..."
Zexama sat on her spiny do an occasional spin around some-what ignoring the body called Yocho crawling on the floor of her room. ”Try to not stain the carpet please.” Said Zexama with a grin on her face. She watched the Saiyan push off her desk to get up and then talking about some stuff about his attack doing harm to him, seemingly more than it did on herself. She kind of ignored his next bit of dialogue before she heard the words. "If I'm gonna die today” She stood up and shouted at him, allowing every single person in the Turtle School to hear. She didn’t care if he had something else to say but she did this. She used her mind to move the chair behind Yocho, hitting into the back of his legs to try and force him to sit. She would then explain. ”You aren’t gonna die today, I have a magical TANK!” Zexama attempted to the throw the chair with Yocho hopefully on it out the side window. She flew behind it and as she got out the Arcosian ship, which was MASSIVE, span around slowly as it caught Zexama, and probably Yocho. She made a whole in the room big enough for both of them and moved the chair inside the whole. Kiwano started at Zexama as ‘steam’ came out of his ears. ”Ki Ki, go put this one in the Rejuv Tank that we just got, he needs it.” Abused Zexama as she waited for Yocho to be taken to the TANK or just sit back down somewhere and die. She herself though sat down on a chair already in the ship and began to sleep as a bubble formed out of her nose. Yocho managed a grin as Zexama screamed for him. All his life, he was used to a pretty bad life. No parents, living in the slums, but here was someone who he had only met a few days ago and she was screaming for him. She wanted him to survive. And if someone he just met wanted him to survive, how could Yocho not want himself to survive. The scream was deafening, but Zexama got her point across. Yocho had to live. Yocho let go of the desk for more than a few seconds. He let go when he tapped his fists together, but that was only for a few seconds. This time he was fine, likely because of the will that Zexama had given him to live. When Zexama mentioned a tank, he had to be left in awe as he had never seen a tank before, but had heard how awesome they looked. Only to realise she probably didn't mean the vehicle tank. That would just be silly. Although maybe not as silly as the giant ship that Zexama flew over. As Yocho was taken to the tank, he started feeling stronger in his mind and soon he would feel stronger in his body. As soon as he entered the tank, he started to feel better. Most of his memories had started to come back, but Zexama's memories were still slowly disappearing. Yocho had no doubt that eventually he'd forget all about her. He was sure that he'd remember her again, just like his other memories, but he needed to let Zexama know before she disappeared from his mind completely. But first, he had to get Zexama. He saw she was sleeping and tapped on the glass of the tank hard as he could to try to get her attention. Yocho didn't know how long it would take to remember Zexama, but he didn't know when he would lose her either. He had to talk to her ASAP! If he couldn't get her attention by tapping, he'd have to try to break down the glass of the tank and talk to her then! He had to let Zexama know that she might not hear from him for a while and that he'd remember her again some day! Zexama was sleeping on her chair of old wood which she found quite boring since it wasn’t made of candy and what wasn’t boring that isn’t candy? She was then rudely awoken by some random tapping noise which echoed through the room that they were in. Zexama leaped off her chair using her antenna as a spring and landed in front of Yocho’s gaze. She then said to him in a clear and unimpressed tone “What?” She then used her antenna to wrap around the top of the chair and pull it underneath her for her to sit on the back support making her seem taller than she was. She looked at Yocho and up to the data readers and saw that Yocho was technically getting better quite quickly. It seems that most of the pain that Yocho was just inside of his head and was just trying to make Zexama feel bad that Zexama’s attack was so amazing. However, Zexama had no training whatsoever about what the dials and everything connected to the machine except the Start button do. She waited for a little while longer before creating a sledge-hammer in her hands and smashing it into the side of the rejuvenation tank and would fix it later, probably. She watched as all the liquid in the tank poured out and a large red warning sign appearing above the dials and the start switch. A warning noise kept blasting on and off around Yocho and Zexama but she just clapped her hands twice to hurry Yocho up and get out of the tank. She said with an impatient voice ”Hurry up Hurry up Yocho, we don’t have all day if you want to enrol in the school of turtles. She walked out of the door and expected Yocho to follow, it seems this is the first test to get into the school.